Human Rights Watch published the World Report 2019 which is addressing human rights issues of the previous year. 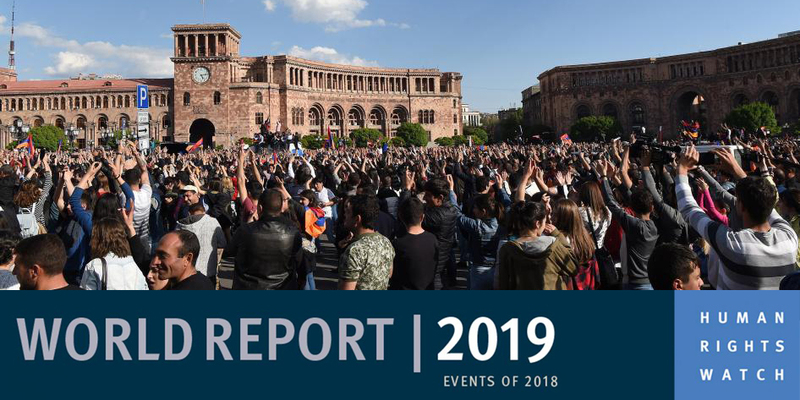 In the chapter about Armenia, the report hihlighted political changes in the country and addressed Yerevan municipality elections, abuse by law enforcement officials, disability rights, women’s rights, and LGBT rights. In the section titled “Sexual Orientation and Gender Identity” the report touched upon the case of the village of Shurnukh, where a crowd of about 30 people attacked nine young people, including LGBT activists. The assailants ran after Hayk Hakobyan and his fellow activists, as they tried to escape, hitting, kicking, throwing stones, and shouting profanities, injuring six. Earlier in April, Hakobyan was the victim of another homophobic assault. He reported it, but authorities failed to effectively investigate. The report also stated that LGBT people face harassment, discrimination, and violence. Hateful and derogatory comments circulated on social media regarding the private visit to the country in May of musician Elton John and his husband. Another concern was the cancellation of the LGBT Christian Groups’ conference planned in November, amid uproar by the public and government officials over the event. Fear of discrimination and public disclosure of their sexual orientation prevents many LGBT people from reporting crimes. The criminal code does not recognize homophobia as an aggravating criminal circumstance. Openly gay men fear for their physical security in the military, and some seek exemption from serving in the army. An exemption, however, requires a medical conclusion finding them “psychologically or mentally unfit” to serve. In Armenia, a finding of “psychological or mental disorder” could be an obstacle to employment or obtaining a driver’s license.